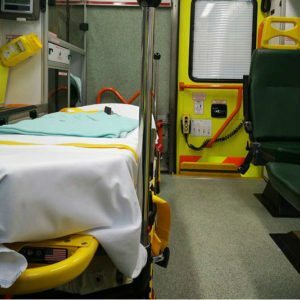 One 25-year-old man’s decision to hop on the bumper of an ambulance resulted in an accident that took the life of an EMT while she was working on March 16th, 2017. The victim and her partner were actually responding to an emergency call when another driver on the road alerted them to the fact that there was an unexpected passenger who had hopped onto the bumper of the ambulance. The two EMTs, realizing the danger the man had put himself into, immediately pulled over and attempted to get him off. The man, who seemed intent on causing trouble, pushed through both women and jumped into the driver’s seat. The victim attempted to stop him and clung to the side of the ambulance where the driver’s door remained open. When the man slammed his foot on the gas pedal, he backed over her and then hit her again when he put the vehicle into drive. The ambulance dragged her along the road for at least 8 – 10 feet before she disconnected. He then drove a short distance where he crashed the vehicle into a car. Thankfully, he was stopped by a group of witnesses and a passing MTA Officer. While he was being apprehended, it became clear that the victim was seriously injured. When another set of EMTs arrived, she was taken to the ER where she was declared dead. A 14-year FDNY veteran, she leaves behind five children. While the criminal charges pressed against the man may help the victim’s family feel better knowing that justice will be served, it does nothing to help them financially. This doesn’t mean they don’t have other legal claims that can help. In New York, emergency medical service workers are covered by workers’ compensation. Workers’ comp doesn’t just help those who survived the accident which injured them, it also provides certain death benefits to those left behind when the worker dies. Death benefits are typically available for spouses and children, although in certain circumstances other family members who lived with and were dependent upon the worker who died may also be eligible. Payments made to these family members are meant to help cover the loss of the deceased’s income. The process of claiming these benefits may not be easy. Insurance agencies are more focused on keeping the money for their company and so they train their adjusters to ask questions which are designed to reduce the amount paid out in a claim. So, even if the claim is approved, it’s likely that the payments won’t be as high as they should be. An experienced workers’ comp attorney can speak with the insurance representative on the family’s behalf and make sure that they get the maximum payouts possible. You can learn more about the workers’ compensation claim process here. In addition to the workers’ compensation case, the family may choose to pursue a wrongful death lawsuit against Gonzalez. This complaint can provide them with additional compensation to ensure that her children are financially safe. This claim can be filed at the same time as the workers’ compensation claim. How Quickly Can The Family Obtain Compensation? If they work with an attorney, payments from the workers’ compensation insurance may start as quickly as a few weeks. However, lawsuits take time and at the minimum will go one for a few months while evidence is gathered, paperwork is filed, and witnesses interviewed.